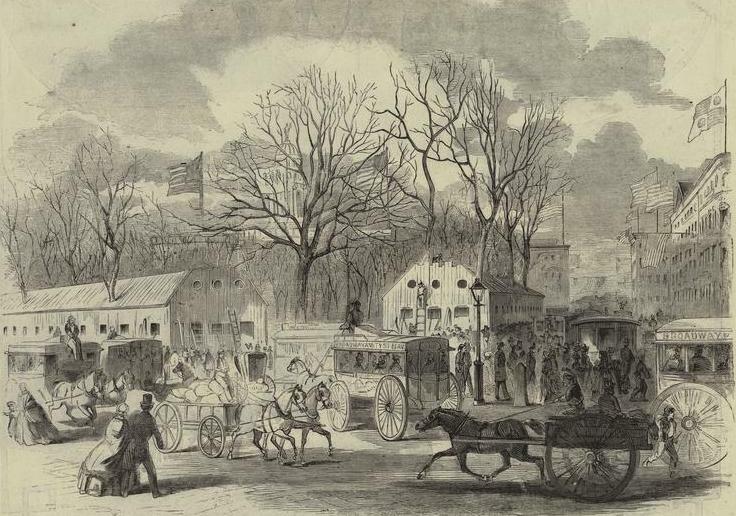 By the middle of May 1861, almost a month into the Civil War, most New Yorkers still swelled with enthusiasm for the Union cause, demonstrated at the great rally in Union Square just a few weeks earlier. Since that historic gathering, the streets were regularly filled with parades, rallies and general cries of support for President Lincoln. Many sons and fathers rushed to join volunteer militias, most notably the brightly uniformed New York Fire Zouaves of Colonel Elmer E. Ellsworth. By the end of May 1861, the Zouaves would become the first Union regiment to capture a city in Confederate territory with their invasion of Alexandria, Virginia. 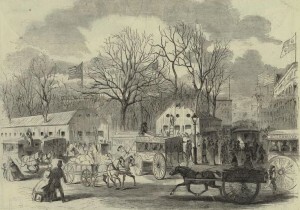 By 1862, when it became clear that the conflict would not reach a swift resolution, the city removed all temporary tents and barracks from public parks but left the structures in City Hall Park intact.